Until the end of flu season, visitation will be restricted for anyone under the age of 12, and anyone with flu-like symptoms. 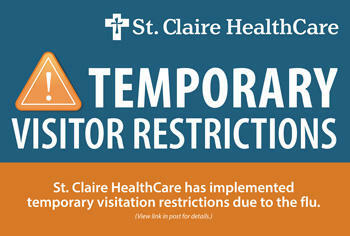 Only two visitors will be allowed in a patient’s room at a time, and they may be given masks or other protective clothing for use when visiting. Additional rules may be in place in special care units, such as labor & delivery, ICU and oncology. Compassionate visitation exceptions will be made on a case-by-case basis. As widespread flu is being reported throughout the state, it is important to remember that it’s not too late to get your flu shot as it is the single best way to prevent the flu. The CDC recommends flu vaccines for individuals 6 months and older. Remember to wash your hands frequently using soap and water or alcohol-based hand sanitizer to prevent the spread of flu. We truly appreciate everyone’s understanding and help in protecting our patients. St. Claire HealthCare would like to thank the more than 200 women who attended the annual Go Pink breast cancer awareness event on Friday, Oct. 26, making this year’s event the biggest to date. We are honored to host this event each year at St. Claire Family Medical Supply, and provide free health education and screenings for the women in our service region. St. Claire HealthCare along with the Morehead Fire Department, Morehead City Police, Rowan County EMS, PHI Air Medical, Rowan County Schools Transportation Department, and Rowan County Senior High School recently performed an emergency drill as a training exercise to ensure all of those involved are prepared in the event of a real mass casualty emergency.